Do you have a “do what needs to get done” mentality? Are you flexible and friendly? Then you’re what FDGD is looking for. We need hearty souls to help us throw a safe and fun frosty festival! 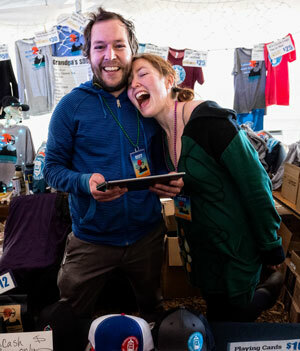 The festival can’t happen without the heart and soul of you, the volunteer—and there is no better way to enjoy Frozen Dead Guy Days than to really be a part of it. Once signed up we will let you know your shift, where to check in and other need-to-know frozen facts. As ambassadors of the FDGD festival, there is no partying on the job. When wearing your FDGD Volunteer shirt, you should be doing your job or looking for other ways to help; this could be picking up trash, directing patrons, or helping door staff. You will be asked to remove your shirt and join the party if not conducting yourself in an official manner. VOLUNTEER REGISTRATION FOR THE 2019 FESTIVAL IS NOW CLOSED.